We believe in giving your puppy the best possible pre and post-whelping care. 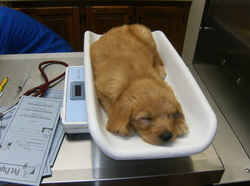 (Yes that is one of our mellow doodle pups snoozing on the vet's scale) To that end, we do everything we can to ensure that the puppy environment is clean and healthy, that the puppy receives wormings and vaccinations on a regular schedule, and we have our vet check them over thoroughly. We therefore can offer a health guarantee that assures you of your puppy's long-term well-being. Please see limited health guarantee below for details. Simba snoozing- Sorry for the 90's flashback but, "Hakuna matata"
The Breeder will have the puppy checked by a licensed Veterinarian before adoption, and the veterinarian will issue a health certificate stating that the puppy has been inspected and found free from visible signs of infection, contagious or communicable disease. The Breeder will also include a current list of all vaccinations the puppy has received to date. Please do not take the puppy into public places more than necessary, until the puppy has had it's 9-week booster (as recommended by your veterinarian) to insure immunity against disease (a few days). The Purchaser will take the puppy to a licensed Veterinarian within 72 hours of receiving the puppy. If the puppy is purchased on a holiday or on the weekend, then the puppy must be taken to a licensed veterinarian at the next available appointment for examination. If your regular veterinarian is not available, you are required to take the puppy to another licensed veterinarian within a week for an exam, or this guarantee will be null and void. If the puppy is found to have health problems attributable to the Breeder at or within 2 months of that visit, the Breeder agrees to accept the puppy back or pay for veterinarian charges up to the purchase price of the puppy. A veterinarian's report must be supplied to the Breeder for this guarantee to be honored and will be void unless these terms are met. All return shipping charges are the responsibility of the Purchaser. The Breeder will however pay shipping charges on a replacement puppy back to the Purchaser. The puppy is also guaranteed (to be replaced by the Breeder when a like animal is available) for one year from the date of purchase, against genetic defects. A veterinarian's report must be supplied to the Breeder for this guarantee to be honored and will be void unless these terms are met. If the puppy develops a genetic defect within the 1-year limited guarantee and is returned to the Breeder, all return shipping charges are the responsibility of the Purchaser. The Breeder will however pay shipping charges on a replacement puppy back to the Purchaser. All veterinarian charges incurred by the Purchaser for diagnosis of genetic issues are the sole responsibility of the Purchaser and will under no circumstances be paid by the Breeder, but again, if any problems are found the Breeder will replace the puppy or refund the purchase price.